Out of all the people in aviation history, everyones knows of the Wright Brothers. So large was their achievement, that it brought with it one of the fastest advancements in technology and science in all recorded history. 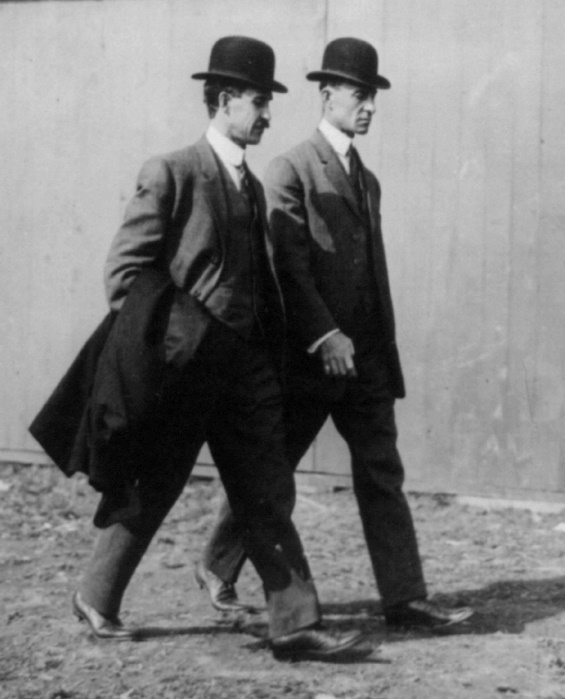 The Wright Brothers, despite all the amazing things they did, were believed to be lying about the first flight. It wasn’t until later that they showed they could not just fly, but fly masterfully through the air. David McCullough, a famous author, just released a book on the Wright Brothers. 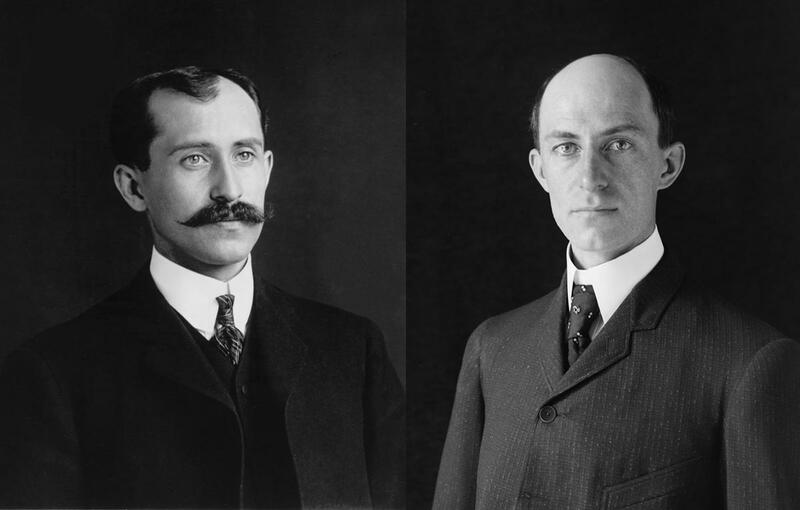 It’s one of the most extensive and illustrative histories of the Wright Brothers. I read it. I couldn’t stop reading it. I was up until 3am reading it, and reading it for minutes here and there when not much was going on. I’m not like that with many books, but I was with this one. 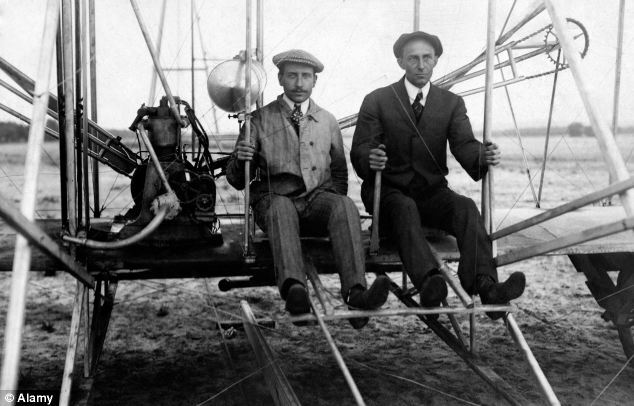 In this podcast I share some thoughts, culminating them in the “7 Lasting Wright Brothers Lessons”- lessons that were true then, and true now. It is possible to fly without motors but not without knowledge and skill. This is AviatorCast episode 65! Chris: Welcome, welcome, welcome aviators. You’ve landed at AviatorCast. My name is Chris Palmer. From the Windswept Dunes of Kitty Hawk to an empty Atlantic Crossing, to my own journey and pioneering spirit, aviation is a big part of my life. I have our forefathers of aviation to thank. The problem of flight has been solved so you and I can surf the solo slippery skies. Welcome to AviatorCast, this being the 65th episode of AviatorCast. This is your weekly dose of aviation passion where we talk to professionals in the aviation industry, mainly inspirational aviators that can share their passion with us. We can hear their stories, relate to them, and we also have topics every now and again like our topic today which I’ll share with you in a couple minutes here, where we talk about different things in aviation, things that keep us going, things that can make us better aviators. That is what AviatorCast is all about. So thank you for joining us each and every week. This week, I’m excited to share with you guys the seven lasting Wright Brothers lessons. So this last week, I read The Wright Brothers book which was very, very inspirational for me, and it just got me back to the basics and got me so excited about the dawn aviation. But you know, I learned a lot of things along the way. I didn’t think that the book would be as instructive as it was for me. And so it really did have a good impact on me, and I want to share with you guys a lot of things that I learned from the book. So this is your spoiler alert. If you guys haven’t read The Wright Brothers by David McCullough yet, make sure to go to read it maybe before you listen to this episode. But if you’re okay with listening to this episode before you go read it, then you’re absolutely welcome to do that, but don’t say that I didn’t warn you. I think the book is awesome. I couldn’t put it down. At times, I was up until 3 in the morning reading it. It was just really, really cool and quite amazing the journey that the Wright Brothers went through to bringing powered aviation to the world. Just really cool. So I have some thoughts and feelings from reading that that I want to share in today’s episode. It will perhaps be a shorter episode than usual. Maybe we’ll come in right around the half-hour mark, but it should be jam-packed and full of great thoughts. So first before we get to the content, let’s read a review. We do that each and every week. We have listeners from all over the world, and if I read your review on the show, then you get a free AviatorCast t-shirt, and this time, I happen to pick someone from a very far-off place. So shipping is going to cost me a little bit, but I’m excited to send this guy. He says “Six stars. Greetings from Singapore.” So we got a review from Singapore, and really, he only gave me five stars, he is only able to give me five stars. So this is from YLFu1983. So this is your review, reading it on the show, you’ll get a free AviatorCast t-shirt. So thank you so much YLFu1983. It’s so cool that you are literally on the other side of the earth and you are so engaged in aviation. It’s cool that you’re subscribed to AviatorCast, to Captain Jeff’s podcast, Airline Pilot Guy. So thank you. Thank you for being here and thanks for leaving a review. Make sure to email me at me@aviatorcast.com and then I will send you a t-shirt soon, okay? Alright guys, so I have to give you one last disclaimer before we get into the seven lasting Wright Brothers lessons and that is is that I am in a new office now. So this is my first time ever having an office outside of home. The business is growing and so I’m in this new office. But I don’t have any sound treatment on the walls yet and so it’s a little echoey in this room. So I apologize for that. I know that the audio quality isn’t going to be as good as it usually is. Some of you won’t notice. You’re probably going to notice mostly if your headphones are on or something like that, but please forgive me, we’ll fix that soon. I need to get up some aviation art or something to deaden that sound, so that process just hasn’t happened yet. So, let’s get into it guys. Let’s get into the seven lasting Wright Brothers lessons. So I spent several nights up until the wee hours of the morning reading this book by David McCullough which just barely came out. Really amazing book. I learned so much about the Wright brothers that I haven’t known before. And here I thought that I was just going to read a book about them getting to doing first flight and that was going to kind of be it. That was pinnacle of what they did. Little did I know, I wasn’t a third or a fourth through the book when I learned about their first flight when that came up. There was so much more in there that I hadn’t known and so as I mentioned prior, this was very instructive to me about the history of the Wright brothers and the connections we have now to what was going on then. And surprisingly enough, there is so much to learn from even those beginning days of aviation that we as aviators today can take and become better aviators. So that is what am going to touch on in these seven lasting Wright brothers lessons because these truly do last the ages, and I hope that you guys can gather some of your own thoughts from this. Again, spoiler alert. It would be great if you guys go and get this book yourself. I think you will really enjoy it. It’s one of those aviation books that is a must-read now just because it’s just so great. Alright, so let’s start out. First, the spark. Like many of us, the Wright brothers became fascinated with aviation at a young age. Only they couldn’t look up and see contrails or hear the drone of a 172 flying by or know of the vastly impressive ability of man to travel outside this atmosphere into space. Rather, there was a stirring among mankind at that time to fly as the birds flew. It was really that simple. They wanted to break ground and get above the ground. It was said by a forefather of aviation which the Wright brothers admired and studied thoroughly, “It must not remain our desire only to acquire the art of the bird. It is our duty not to rest until we have attained a perfect scientific conception of the problem of flight.” Although it seemed most believed man would never fly, there were a few who were crazy enough to dream. Some of those were the Wright brothers and their close friends and people that they were in contact with. 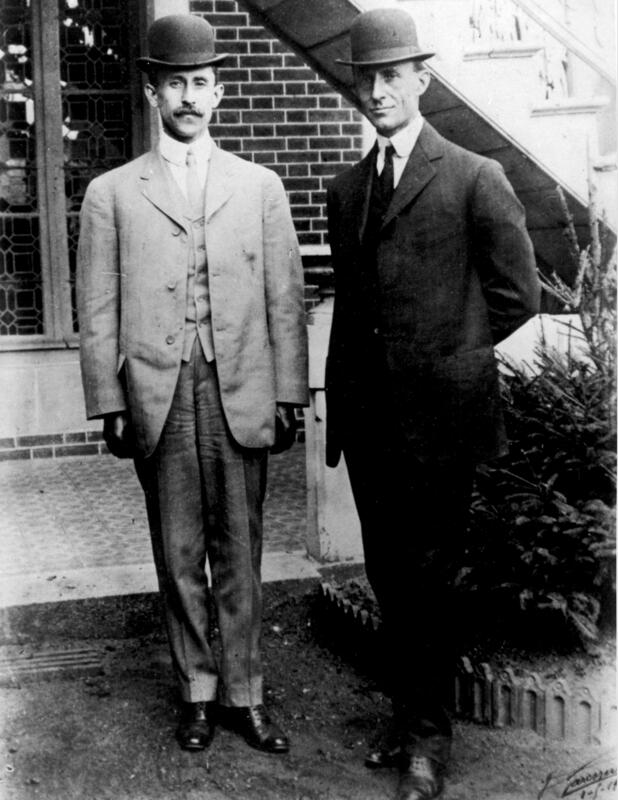 The Wright brothers of course admired aviation as students of science. However, this wasn’t always their pursuit. Their main line of business was actually in bicycles which at that time was a new and booming business. By owning and running this bicycle business, they continued their pursuit of engineering by developing and improving their bicycle or they actually had their own bicycles that they built, their own models, and they also had this business. So with each one of these, I’m going to have a what can we learn from this section? So here is the what we can learn from this, and this is all kind of in chronological order by the way. So what we can learn from this, most us listening already have that spark for aviation. However, there are a few things to mention here. First, we can be that spark for someone else, be it a child or an adult. Passionate pilots and evangelists of being aloft. They enroll people into their desire for flight. Second, if you’ve lost the spark, how can you reconnect with it? That can be done in many ways. One of the best ways is getting back to the basics. So just you, an airplane and the sky, not for work, not for really any other purpose than just to go up and do it because we can. And that’s just really been fascinating this last week. I think about it a lot. It’s like we can actually fly. That is so cool. Alright, so that’s the spark. Drive. One day, the Wright Brothers became sick. Not literally sick but sick with the thought of aviation. You’ve heard of people catching the aviation bug. I know that I sure did. Well, I can tell you that it is real. It was real for the Wright Brothers just it is real now. Many people are catching it and I hope some of you have caught it to an even greater degree by listening to this show. So we are all sick, that is basically what I’m saying. So sick were they, the Wright brothers that they wrote the Smithsonian Institute asking for any and all material they could send on the subject of flight. Their thoughts were consumed by the idea. Wilbur and Orville were constantly discussing and pursuing these thoughts and ideas as they worked on their business. Sparked in them was a drive to now do something about it. They were going to be aviation inventors as they had been with bicycles. So this quote really strikes home for me. “I sometimes think that the desire to fly after the fashion of birds is an ideal handed down to us by our ancestors who in their grueling travels across trackless lands and prehistoric times looked enviously on to the birds soaring freely through space at full speed above all obstacles on the infinite highway of the air.” Don’t you just love that quote? I think that is awesome. So what can we learn from this? There comes a time for every pilot where the decision is made to go for it. There comes a crossroads where many realize if I don’t pursue my pilot’s license now, or this career now, I’ll never have a chance. And it’s kind of a gut instinct that I think a lot of people have and it’s true. There is a door or a window, whatever you want to call it, that closes on that opportunity. So like the Wright Brothers, once that decision is made, there is no looking back and no quitting. As is the common theme throughout this book, the Wright Brothers had absolutely no financial backing, continual setbacks, slow progress and at times, broken hearts, let alone airplanes. We aren’t unlike the Wright Brothers in this way. There still remains much difficulty in gaining the cash to pay for flying. There will always be setbacks, just plan on it. Progress isn’t always as swift and quick as we may want as you’ll have to build time as a pilot or even sometimes take more time on the subjects you have trouble with. And your heart will be often broken in your pursuit of this dream. But it can be mended by the strands of air that you continually and forcefully pound into submission, one knot of airspeed and one foot of altitude at a time. Study and knowledge. So can you imagine for yourself a world where little to no discoveries in aviation have been made, where everything was new. Flight controls, basic aerodynamics principles and all manner of acronyms that you and I know, you know, that long dictionary of acronyms. They didn’t even exist at this time. This is the world in which aviation pioneers like the Wright Brothers actually live. I mean, they were literally the pioneers of aviation, inventing a lot of these stuff as they went along. 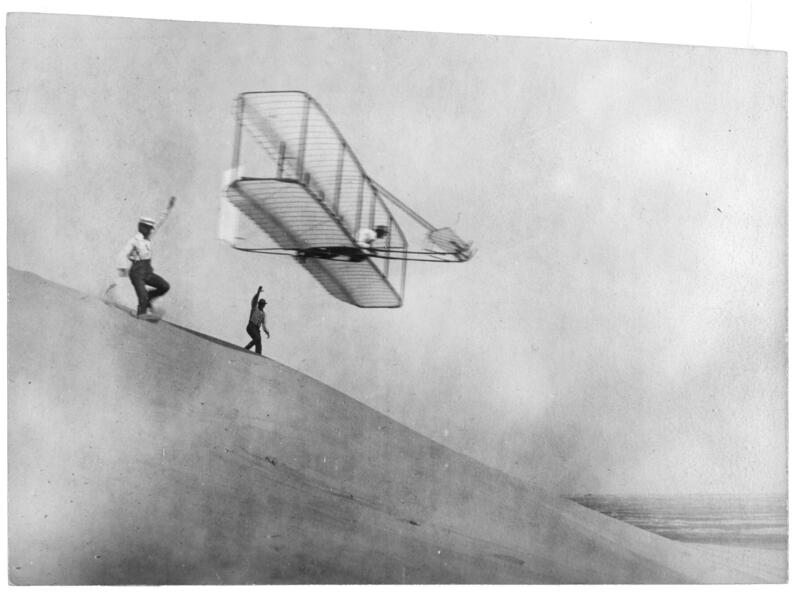 So although there were a handful of scientists and people nearly as crazy as the Wright brothers trying to solve the problem of flight, no one had succeeded in doing anything more than several hours cumulative of gliding and things like that. Lots of crashes, deaths, people that were trying powered flight. No one was really successful. If there is anything you can unequivocally say about the Wright family, even the brothers themselves, it is that they were all intelligent, hardworking, and determined to a fault. Upon knowing that aviation would be a future pursuit, the brothers delved into book after book and paper after paper. They began making connections among the aviation community which as you can imagine was a very small amount of people spread across a then sparsely populated nation. Nonetheless, they did all these. They made these connections. They learned all these things and they tried things out as they went along, and they pioneered much of what we know about aviation today. So what can we learn from this? Although the Wright brothers weren’t college graduates, they had an attitude of continual learning. We’ve talked about that a lot here on the podcast. We too can learn in a perpetual and continual fashion, constantly subjecting ourselves to growth and improvement. It’s worth noting that aviation isn’t the only area that can improve as aviators. There are many related fields to our flying that can help us better or become better, more Wright Brothers-esque pilots. We would do well to subject ourselves to an ever evolving knowledge in aviation, never to remain stagnant, never to become complacent. Build skills. 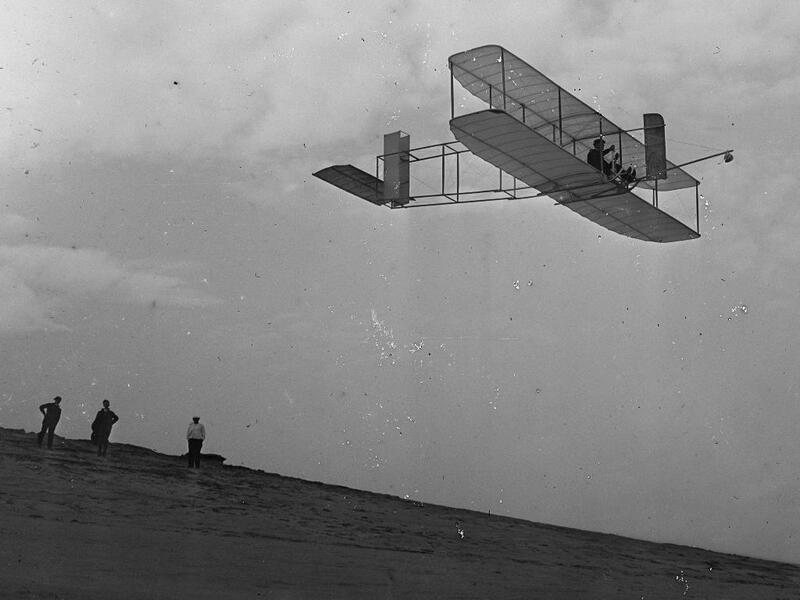 To practice their skills and build knowledge of flight, the Wright brothers selected an obscure location on the Carolina coast called Kill Devil Hills. This was in the area of Kitty Hawk I believe. A desolate landscape of sand dunes and a persistent wind made this the perfect place to glide a flying machine and at this time they were gliding. The brothers set up camp where they would stage their experiments for months at a time, year after year. With no funding, they could only remain her for a few months at a time but that’s what they did. They did what they could do. The remainder of their time was spent building the next version of the aircraft in their bicycle shop while they kept the business running and the money flowing. So first starting off by holding up their flying machines like a kite and then eventually gliding a great deal and finally to the famous first powered flight. They did all of these basically living in a tent, kind of roughing it out in the wilderness, and building the airplanes, repairing the airplanes, experimenting, little by little they went. So over this time, the Wright brothers were becoming more familiar with the aircraft itself, modifications to design, and the actual control skills, and year after year, they improved their airplane each time. So eventually they actually created a wind tunnel. If I’m not mistaken, it was the first wind tunnel that was created and they made the correct air foil for their wing because it just wasn’t doing exactly what they needed to. So out of all the time they spent improving their skills, they spent the least time improving their flying skills. I want you to remember that. So out of all the time they spent improving their skills, they spent the least time improving their flying skills. Truly, they were only in the area for a matter of hours as compared to what they spent building, modifying and repairing the crafts. So think of how much time they spent doing the other things that they needed to do to fly. I think we’re very similar to this. So what can we learn from this? I’ve always maintained that flying was only a small percentage flying skill and the rest was knowledge, decision-making and so on. The Wright brothers proved this at the dawn of aviation and it has yet to change. I thought that was really, really cool. You may say we have more to manage these days and more to contend with. There are even now regulations, communications, glass panels, navigation and a whole long list of things that a pilot must do in order to have a successful flight. So there is definitely more to be watching out for now. We do have a great challenge in being well-rounded pilots, I get that. And that is something that we must recognize. However, let’s not forget that although the Wright Brothers didn’t have to do all that we have to do, they were in a world of complete and total unknowns. Again, aviation wasn’t even a thing. Most people didn’t even believe that it would ever be a thing. These guys were literally the inventors of powered controllable flight. They knew nothing, only what they had figured out on their own each and every time they took to the air. To end this section and what still remains one of my favorite Wright Brothers quotes, and I said at the beginning at the podcast, Wilbur said “It is possible to fly without motors but not without knowledge and skill.” That is as much true today as it was then. Not for show. With the unmistakable rippling effect the Wright brothers’ first powered flight made in the history of mankind, there was little fanfare. Only a few people witnessed that first flight and the news didn’t catch on quickly that man had flown for the first time. The Wright brothers spent the next several years building new models of the aircraft which they would fly closer to home in a new location. In other words, they didn’t want to go back to the Kill Devil Hills and have to rough it for so long. They could just take the train down the street sort of thing and practice there right in Ohio. So even with new crowds of people, albeit still limited amounts of people seeing the Wrights fly, the general world populace still did not believe that they had cracked the code. This really surprised me. There was plenty of exposure to the fact that these guys were actually flying, and they even had some governments, I believe it was the British government and the French government come over and actually see this but they still didn’t believe it. I think that maybe the Wright Brothers didn’t actually do demonstrations for them but they had pictures of them actually flying, but still people didn’t really believe it nor catching on. So during all these, no reporters were called. No big events were planned. The Wright brothers simply continued with their work, making an improvement here an adjustment there. They were refining their craft literally. It wasn’t until years later after being rejected by many governments as not being for real basically including their own here in the United States, but the Wright Brothers started demonstrations in France. Upon seeing that the Wright Brothers in fact hadn’t been lying and that they were not just flying but flying masterfully through the air, the world started to go absolutely wild. Flight had come to mankind. Thousands and thousands of mostly French but also world citizens would travel and descend on these demonstrations to see exactly what all the fuss was about. Flying itself had become a sensation and a reality. It was Wilbur who was then on his own in France who became a great curiosity of the people. This man who was unassuming yet with a powerful presence had been working in relative obscurity for years. Still not wanting to embrace all the celebrity but always remaining true to himself, his character was nearly as much of a story as flying. Even after years of demonstrations all across Europe and eventually to the states as well, Wilbur and Orville would remain true to their beginnings and their character. It was only at this time after years of hard work, years of hard work, tweaking, twisting, problem-solving and practice, that they had started to make money at this aviation thing. The rest of the time, they were just refining their craft and moving along in a steady pace without all the fanfare, without the celebrity. So now that the people actually saw the Wright brothers flying and they believe them actually, their planes were bought by many people, governments mainly, and prices were won by breaking records. So what can we learn from all these? I was happy to learn that the Wright Brothers were humble individuals, always improving as aviators, and never boasting about who they were or what they could do. We too as pilots, although we carry a certain level of cool by simply being a pilot, ought to remember that even these forefathers of aviation didn’t boast about their achievements. We’ve done little but learn to fly an airplane that someone else made with knowledge that was passed down to us. So these guys learned how to fly an airplane that they built themselves bit by bit and try after try and by knowledge that they themselves for the most part gained through those experiences. Being a humble pilot also ensures that we don’t get in oru own way when it comes to flying. We aren’t all-knowing, we are quite vulnerable and we aren’t as macho as we thing we are. Flying for us should never be about the show. It should be about, wait for it, flying. It should be about the act of doing something that is unbelievable still after these hundred-plus years since the dawn of aviation. Keep trying. Wilbur wasn’t the only one to fly in front of the large public audiences. Orville was now conducting flights of his own in the United States in Fort Meyers just outside Washington DC. This was a choice place as the US government would undoubtedly see the aircraft and want to buy it. While still very careful in their flying and guarded in their secrets, the brothers were putting on a show for the world. Many people came from around to see all of these and just an example was all the US government offices closed for one day and the senate and the congress included, everybody shut down basically just to come out and see Orville fly, only he didn’t actually fly. The winds weren’t good enough and he didn’t feel that he should fly that day. So he pulled the aircraft in the hangar and let many of the nation’s most important people disappointed. I thought this was pretty funny. Out of all the people in the world at that time, the Wright brothers had immunity in such cases. They could do no wrong even if it meant sending all these important people home. Can you imagine all of these senators and congressmen and council everything, came out to see the airplane and he was just like “It’s not good enough. I’m gonna pack it up and put it in the hangar.” If that were you and I, imagine the pressure to go up and fly. I think I myself would probably give in. That’s just a tremendous amount of pressure. So these guys had a cool head. So to continue the story, days later while giving a ride to an army lieutenant, Orville and his passenger actually crashed. A prop had become intertwined with a wire, shaking the aircraft violently and eventually bearing it no longer flyable in midflight, they plummeted to the ground, it crashed. This would become the first fatality of powered aviation. The lieutenant would not survive with too much damage to his head, and Orville would actually survive but although just barely. He had a long recovery process. His sister would be by his side throughout his recovery which was long and difficult. So bad was the break in his leg, I believe it was actually shattered, that Orville’s leg would be noticeably shorter. It was by an inch or so. He spent much time recovering in Washington, back home in Ohio eventually and eventually gaining some much needed rest and invigoration while on tour with the family throughout year up when Wilbur was over there showing it to different countries and things. In an inspiring move, this is what I love, upon returning home from Europe, Orville made up his mind. He would fly again and he would fly again at Fort Myers. Being the loving brother he was, Wilbur was now right by his side. He didn’t discourage him from doing so. He was simply there to help him with the preparations and supporting him in all the ways possible. Whereas Wilbur was able to manage and perform all on his own in Europe under immense pressure which had a large toll on him still, Orville would get a bit more flustered, anxious and nervous, pacing about, just it got to him, all the pressure got to him. So that was not a super great combo for a pilot. But you can imagine if the world’s eyes are on you, it would be pretty difficult. But I just really love how after a brush with death and a horrific recovery, Orville was back flying again. And this time, he was breaking all sorts of records. He broke a lot of Wilbur’s records in his flying pursuits. So what can we learn from this? It’s true throughout the lives of the Wright Brothers that determination and persistence were part of their characters. We will all get knocked down at some point to one degree or another. Although I can’t speak for every situation, I can say it is almost always worth it to get back into flying. You guys may remember in a podcast several back that I came up or coined the acronym PHD which stood for passion, hard work and determination. These Wright Brothers definitely had those qualities about them. Know your machine, and this is our last one. One thing I found amazing about the brothers, especially Wilbur, is that he would spend hours and hours preflighting the aircraft he flew. With tens of thousands of bystanders waiting for him to get up and go flying, he wasn’t the least bit rushed. They’d wait all day looking on as he prepared this and that. Then around dusk, he’d take off into the air. Of course there were days where he did many, many flights but never without knowing each and every flight of his aircraft. He was even in position where the first ever flight had been done, right? It was on a Saturday, the first ever flight in front of a large public audience had been done, it was on a Saturday, but the Wright brothers did not do anything on Sunday. So after all of that initial excitement on that first day, Wilbur basically said “I’m not going to fly on Sunday.” And so everyone had to wait until Monday and wait they did and they still enjoyed it a whole lot. But these were guys that were very patient and they definitely knew their machines very well and they just took a lot of time with it. What can we preflighting the aircraft he flew. With tens of thousands of bystanders waiting for him to get up and go flying, he wasn’t the least bit rushed. They’d wait all day looking on as he prepared this and that. Then around dusk, he’d take off into the air. Of course there were days where he did many, many flights but never without knowing each and every flight of his aircraft. What can we learn from this? Now, I admit that I don’t know everything there is to know about the airplanes I fly. In fact, I’d say I don’t know hardly anything. Compared it with what the Wright brothers knew about their aircraft, I would do well to learn more about the aircraft that I fly. So perhaps you are in the same situation. Maybe there is more care you can give to your aircraft. Maybe there’s a deeper knowledge you can gain from it. I think that’s something we can learn from the Wright brothers as well. And that’s it. Those were my points. Again, the seven lasting Wright Brothers lessons. The first is the spark, that spark and passion. The drive, finding out that you want to get in the aviation and going for it or getting back in the saddle. The study and knowledge part of it which you have to continually learn to be an effective aviator. Building your skills. We often focus on building our skills through flying but we don’t realize that there’s a lot of other areas where we need to build our skills as well. And then there is not being a show-off, this not being for show, but this all being because we love to fly, because this is something that we are passionate about. And then, keep trying. So, you remember Orville and his crash and the fact that he went back to the same place where he had a brush with death, his passenger actually died, and he picked up his journey from there and continued to fly, so I just thought that was amazing. And then knowing your machine. So that is it. I hope you guys got something out of my thoughts from the book. I know that you’re going to be getting your own thoughts when you go and read this book. Again, I really encourage you to do so. I would love to hear your takeaways from the book. It will be very insightful for me and maybe those are things I can even share on the show. So feel free to reach out to me, me@aviatorcast.com, and I would be happy to hear your thoughts as you read through this book. I think it’s great. Again, it should be required reading for all of you. If I was your teacher, I would require you guys to read it and report back on the book, but that is not the way it is, so just go out and read and have fun do it. You can find a link for that in the show notes for this episode. Just go to aviatorcast.com and you will be able to find that, and we’ll go from there. Alright guys, so let me have my announcer guy here give you guys a couple of lines, and then I will be back to close out the show. Chris: Alright everybody, again, it was so great to have you here on this episode of AviatorCast. Thank you so much for joining us each and every week. You guys are absolutely awesome. Keep up the great work, keep flying and keep the passion alive. A big thanks to the Angle of Attack crew for all of their hard work. These guys do a great job so that you and I can talk each and every week and have some fun. And then thank you, the listeners for showing up each and every week, for reviewing the podcast. You can do that, and then I’ll even send you a t-shirt if I read it on the show. But reviewing the podcast really helps me out because it spreads the word of AviatorCast and boost us up in the rankings. I work hard to make sure that this podcast is great each and every week, so please do me a favor, go review AviatorCast. You may even get something out of it. I would really appreciate that. And any thoughts you guys have, any recommendations, anything, reach out to me at me@aviatorscast.com. I love to talk to people so I would love to hear from you. And that’s it. So join us next week, we’ll have another great episode and until next time, throttle on!